Of course, no one can say for sure what the new year will bring. But in some areas, there are people who can make educated guesses. The Early Show's entertainment contributor and senior editor of entertainment for People magazine, Jess Cagel, took a look at some upcoming films for the new year, and he says to expect more big-budget movies with a few sleeper hits. Click here to see the story. As we kiss the prairie look and decked-out denim looks of 2002 goodbye, we greet the new fashions of 2003 with open arms. David Evangelista talks about a few fashion trends we'll be seeing in the new year. Click here to see the story. With the ringing in of the new year comes the inevitable onslaught of new television shows vying for our attention. Lisa Bernhard, deputy editor of TV Guide, tells The Early Show what we can look forward to watching in 2003. Click here to see the story. MTV News Correspondents Gideon Yago and Iann Robinson have a news show called "The Wrap" on MTV2. 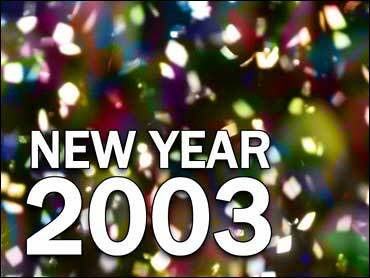 They review the music of 2002 and they give us their picks of top artists sure to make an impact in 2003. Click here to see the story. Early Show Medical Correspondent Dr. Emily Senay examines advancements in cloning and treatment of arthritis and heart attacks that may change our lives. Click here to see the story. Muriel Siebert, the founder of Siebert & Co., Inc. recently testified on Capitol Hill about how corporate scandals have affected individual investors. She tells us whether things will turn around in the new year. Click here to see the story. Money Magazine personal finance writer Ellen McGirt offers constructive advice on how you might want to spend your money in 2003 how you can correct the course of your financial ship. Click here to see the story.